Danielle Stevens is a graduate of George Washington School of Medicine and is currently a resident fellow at Georgetown University Hospital. Stevens is interested in pediatrics and gynecology as well as pediatric surgery. Stevens has been writing professionally since 2008 for The American College of Obstetricians and Gynecologists, Words and Numbers, and Prime Inc.
An allergic reaction to cabbage is rare, however, serious reactions are possible. Within a few minutes to an hour of ingesting cabbage, the immune system begins producing IgE antibodies that target the proteins present in cabbage.The symptoms are typically mild, however, anaphylaxis, a life-threatening reaction may occur. Seek immediate medical attention if you experience breathing difficulties after eating cabbage. Cabbage is a source of antioxidants, and is used by alternative medicine practitioners to treat jaundice, rheumatism, scurvy, constipation, eye disorders, heart disease and neurodegenerative disease such as Alzheimer’s disease. 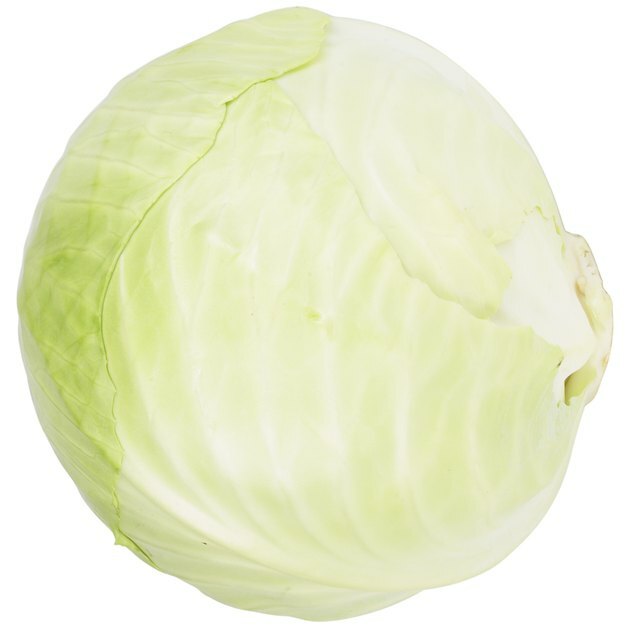 Cabbage is a source of vitamins C, A, B-1 and B-2 as well as sulphur, potassium, calcium, magnesium and folate. Vitamin C and sulphur strengthens the immune and nervous system, prevents bacterial and viral infections, and treats skin disorders, such as eczema. The high levels of antioxidants and polyphenols in cabbage prevent the damaging effect of free radicals. They also promote cardiovascular health, and reduce your risk for tumor development and growth, especially in the form of ovarian, breast, colon and bladder cancer, according to the Organic Facts website. Cabbage has not been approved to treat any condition by the FDA, and there are no scientific studies that show that cabbage can treat or cure any illness by itself. Talk to your physician if you have a specific health problem or concern. Chitinase is a protein enzyme that has been extracted from the stems and roots of cabbage, and shown to trigger an allergic reaction. A lipid transfer protein known as "Bra o 3" has also been characterized as a cabbage allergen. The immune system identifies this proteins as foreign and dangerous, and begins the production of IgE producing antibodies. These antibodies activate and bind to proinflammatory immune cells known as mast cells. The signs and symptoms of an allergic reaction to cabbage is due to the release of histamine and other chemical mediators from mast cells. Allergy symptoms appear within minutes to a few hours of ingesting cabbage. The release of histamine into the bloodstream results in swelling, tingling and itching of the mouth, tongue, lips and face. Swelling, redness and inflammation of the skin is commonly observed and can lead to a skin rash and lesions. Histamine is also released in the gastrointestinal tract resulting in abdominal pain, nausea, vomiting and diarrhea. The release of histamine in the throat, larynx and airways results in swelling and constriction of the airways, bronchospams, wheezing, tightening of the chest, coughing and difficulty breathing. In rare cases, an individual may develop anaphylaxis, a life-threatening reaction that causes heart palpitations, nausea, light headedness, and unconsciousness if left untreated. Seek immediate medical attention if you experience breathing difficulties. If you know you are allergic to cabbage, the best way to avoid an allergic reaction is strict avoidance of raw or cooked cabbage. Salads, coleslaw and sauerkraut also contain cabbage, and should be avoided. Broccoli and Brussels sprouts belong to the same family as cabbage, and thus contain similar proteins. Always read the label and ingredient list for all food products to ensure they do not contain cabbage. If you accidentally ingest cabbage and develop a mild allergic reaction, over the counter antihistamines and corticosteroids can help reduce the inflammation and discomfort. If you have experienced a severe allergic reaction in the past, speak with your physician about carrying an epinephrine auto-injector.